Meet Our Photographer Of The Month! Sheldon Botler. 10 Things Photographers Need To Stop Doing in 2019! Concrete Studios LA would like to wish everyone a Happy New year! We’d like to start 2019 strong and with intention so, here are a few things we suggest to leave behind in 2018 to become a better and more efficient Photographer. We are taking some notes too! First, please stop doubting yourself! We are constantly questioning if our ideas are great and if they will translate to others in the same manner we want them to. Self- doubt is a mind crippling, never ending cycle that forces us away from realizing our full potential, which is ultimately fear based. We often have fear of things that don’t necessarily exist in the here and now; usually by the scenarios we create in our minds. We encourage you to get out of your head and into your hands to create the work you want this year and to not let self doubt stop you! Grant yourself permission to be all that you can be in 2019. In like manner, try not to compare yourself to other Photographers; as it is another perpetuator of self doubt. Instead, let other photographers inspire you and remind you of the infinite possibilities of creation. Our culture is constantly bombarded with images and it can be quite challenging to not compare our work. However, comparing ourselves to others is an annihilation of the Self. Do not censor nor silence your art; but instead say what you need to say. There is no one like you and only you can create the things that are in you. And let’s leave marketing to other photographers in 2018 and start marketing to our clients in 2019! It is important as photographers that we find community; which usually are in/ with other photographers. In community we feel less alone and we sometimes can fall into soliciting the attention and confirmation from other photographers, such as, in blogs directed to other photographers and their technique instead of blogs written to potential clients, spending time in tutorials instead of networking with our next client and so on and so forth. We encourage you to start paying attention to where you put your time and attention; and remember wherever your attention goes, energy flows. Finding community is an imperative part of keeping your wits in this industry full of flux but as a business person we should focus our attention on marketing ourselves to clients so that we expand in the most meaningful and possibly lucrative way! Speaking of clients, let’s stop blaming our clients! Take a moment to reflect. If you spent your 2018 complaining about your clients, pull yourself up by your bootstraps and take personal responsibility because that is ultimately the only way to make change happen! It is not the client’s responsibility to choose a suitable colored backdrop that compliments their skin and/or the best time to capture the sunset; which, ultimately will be reflected in YOUR portfolio. Our clients are not photographers. That is why they hire you because you are the professional. Moreover, we as photographers can fall into the trap of sitting at our desks, in front of the computer; so much, to the point where we are doing more sitting than moving around and shooting. We know! There are tons of things to do, such as: answering emails, editing, creating logos, fine tuning our website, etc. However, this habit can become a health hazard and an ultimate detriment to your shooting stride. We urge you to be more aware of your body and to move around more in 2019. A healthy photographer is a happy photographer! Stop working without a system first! Take your time to set up a system before working, as it will increase your efficiency and consistency. Having a system in place for when you do your common, day to day tasks, means you will produce the same results each and every time which will insure your clients are taken care of at the same standard. This means less complaints. Remember, there is always an expectation in which our clients have for us and it is imperative that we strive to meet them each and every time; moreover, it is important to have so when deciding if the system can be approved or not. Having a system in place also means, when you outsource someone to fill in for yourself, you have a measure. So, create your system and build from there! Please stop using someone else’s measure of success as your own. We are all different photographers who have entered into this industry for different reasons; headshots, celebrity portraits, wedding, etc. First, define what success means to you. The absolute one thing is aim for someone else goal. Following someone else’s blueprint will surely lead to disappointment and/ or a discontented state of mind. Likewise, stop imitating other photographers! This goes hand and hand with using another photographer’s measure of success. Though imitation is one way to learn as you may very well adapt your own style to an already existing standard; it will eventually stifle you if you don’t grow beyond it. Growing into your own style might seem hard at first because it does require courage, vulnerability and knowledge of self but it is so worth it! As stated before, there is only one you and your vision is a unique. We encourage you to get in tune with your own voice and say what you need to say! Please stop listening to your ego and learn something new! We implore everyone this year to step put of their natural comfort zone; whether that is shooting natural light, with studios strobes or against the same old, tired backdrop colors. There is always something out there for us to learn. Even if these setups seemingly work for us each and every time, they can become our prison and stagnate us as artists. A huge part of being an artist/ photographer is having the ability to creatively think on our feet, especially when working with a multitude of clients, who’s needs can be very different. Adhere to Murphy’s Law; anything that can go wrong will go wrong! Arm yourself with knowledge and different ways to perform the same thing so that you have every tool available at your command. And lastly, stop doing the same old thing. A comfort zone is a lovely place, but nothing ever grows there and growth should definitely be the paradigm in which we shift in 2019! You have an entire year to experiment. We are not encouraging you to completely abandon what works for you, however, we are encouraging you to expand your circumference of knowledge. The industry is always changing, always growing and so should you. We look forward to seeing what you come up with this year! Concrete Studios LA welcomes SKYZONE to our Rooftop! Film Making TIPS: 5 Essential Looks Using ONE Light! In coming! STUDIO TIPS! This video will suggest 5 lighting setups using only one light! Sometimes, extra lights can complicate things. With one light, you have less to think about. You will also have less technical things you have to control and more time interacting with your subject! Furthermore, using one light is the perfect way to grasp an understanding of light and shadow on faces, in general. Learning how the positioning of your light on your subject will affect the final look of your portrait. The distance between the strobe in relation to the subject will affect the quality of light as well as the size of the light source; but the height, width and angle will also determine how the shadows fall on the model’s face. It is important that you pose your model to match your chosen lighting setup, then move the light around instead of getting the model to move. Flat lighting: Clean and simple, but also flat and boring! Paramount lighting: Butterfly shadow under the nose; movie star lighting. Loop lighting: Similar to Paramount lighting, Loop lighting is angled slightly to one side of your subject for more of a dramatic look! Rembrandt lighting: High-contrast, Rembrandt lighting is great for emotionally darker or intense scenes. Split lighting: This technique is achieved by placing a light 90-degrees to the side of your subject to put half of their face in shadow and half in light. Check Out Concrete Studios LA Latest Collaboration with Tillys! Concrete Studios LA, at your leisure, accommodates Artists by providing spaces for solid content! It was a delight for us to host Tillys on our Rooftop as they shot their new RSQ Jeans Fall Collection 2018! The Sun was high and provided the most beautiful hair light as well asa mixture of hard and later soft shadows as it began to go down. 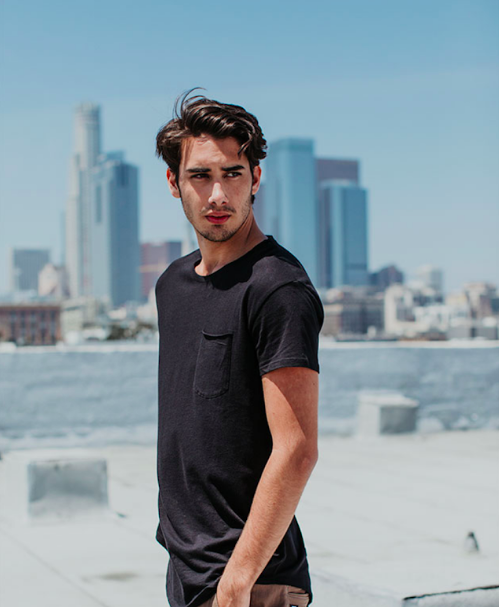 Tillys jeans merged quite harmoniously with the backdrop of the city. Our Rooftop has one the best views in DTLA! 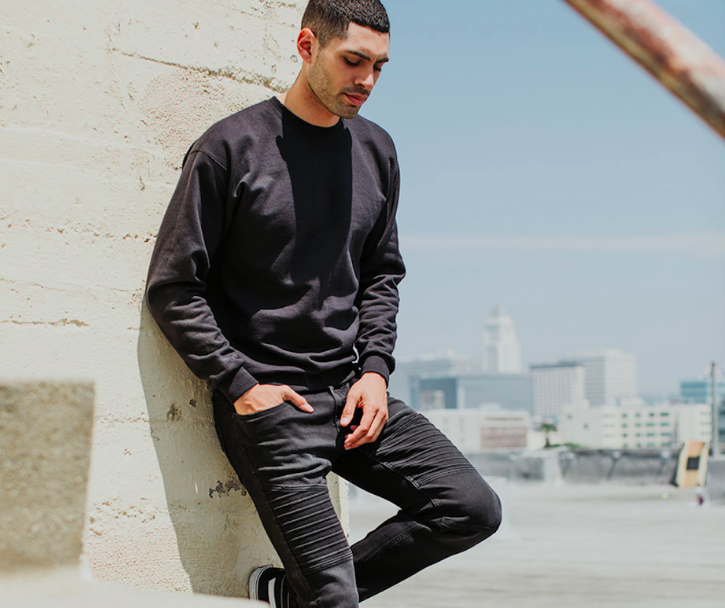 Tillys is a leading specialty retailer of casual apparel, footwear and accessories for young men, young women, boys and girls with an extensive assortment of iconic global, emerging, and proprietary brands rooted in an active and social lifestyle. Tillys is headquartered in Irvine, California and currently operates 222 total stores, including three RSQ pop-up stores, across 31 states. Concrete Studios LA provides spaces for artists and creatives of all kinds to make content that provokes change and inspires vision! Our Rooftop is open, versatile and flexible for everyone to use! If you would like to shoot your next video or photo shoot in one of our facilities, please check out our BOOKING CALENDAR to view the schedule and book! Meet our photographer of the month, Jessica Czarnecki! Concrete Studios LA Lends a creative space to Talent, Spencer Lee! Concrete Studios LA welcomes Spencer Lee and her Team! ROGUE MAGAZINE x CONCRETE STUDIOS LA COLLABORATION! Concrete Studios LA has had the pleasure of hosting Rogue Magazine as well as the talented Olivia Munn who graced the cover of their SPRING/ SUMMER ISSUE N˚9! Olivia Munn is an Actor/ Model who spent much of her earlier years in Japan. She later moved to Los Angeles, which would be the start of her acting career. In her genesis, Munn joined G4 TV host of Attack of the Show! and Comedy Central's The Daily Show, almost in congruence. Munn is mostly known for her film roles in Date Night, The Babymakers, Deliver Us From Evil, Iron Man 2 and X-Men: The Apocalypse. These beautiful portraits were shot Studio C, which is known for its beautiful ambient light, Cyc wall and many other options! Here, Olivia Munn was lit with a variety of light sources, including (the most obvious), Kino Flos to create soft and lofty vibes. The pastel colors chosen added to the feel as well. Concrete Studios LA is here to provide spaces to artist of all kinds that create works that inspire vision and promote change. #CREATEHERE for your next shoot! Instead of having to add color to your photo in post you can achieve this in camera by using gels. In this video you will learn 4 ways to mount gels to reflect back at your subject to achieve vibrant color; specifically in your shadows. You can attach the gel to a strobe alongside or across from your key light. You will want to make sure the strobe that has the gel attached to it is dialed a few stops down, so not to obstruct the subject's face. You can also place a gel inside of a soft box, which you can place on either side of your subject as a fill light. As another fill source, you can use white foam core with a colored gel attached to it, which typically affects the hardness of the shadow on your subjects face, but in color. You can also attach your gel to a mirror which gives the shadows more of a hardness to them against the subject's face. On your next photo shoot at Concrete Studios LA, be sure to bring your own gels and try some of these looks out or ask us to borrow some of ours. See you soon and Happy Shooting! STUDIO TIPS: How To Sculpt Light Using Flags! Learn the Laws of Light w/ Concrete Studios LA! Amazing Headshots by Kyle Allen!